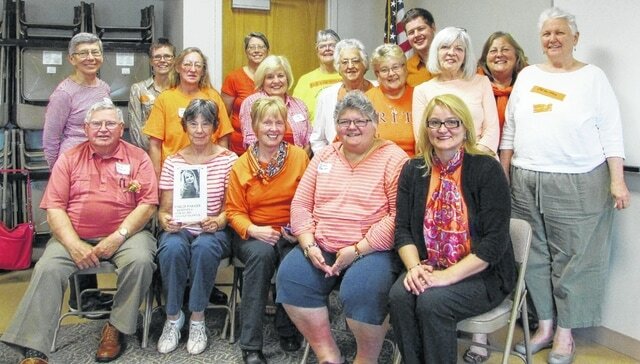 Donna Carver | Morrow County Sentinel Members of the Morrow County Democratic Women’s Club wore orange at their Tuesday June 2, 2015 meeting as part of the National Gun Violence Awareness Day. Members of the Morrow County Democratic Women’s Club wore orange at their Tuesday June 2, 2015 meeting as part of the National Gun Violence Awareness Day. Tuesday marked the first national “Wear Orange” campaign. The 2013 death of 15-year-old Hadiya Pendleton, who was mistakenly shot in the back and killed by gang members, is behind the movement. Pendleton was standing with friends inside Harsh Park in Chicago after taking her final exams. A student at King College Prep High School, she was killed only one week after performing at events for President Barack Obama’s second inauguration. Project Orange Tree, an organization started by Pendleton’s friends after a youth panel discussion about her death, asked people to wear orange on Tuesday June 2, 2015, which would have been Pendleton’s 18th birthday. Reach Donna Carver at 419-946-3010, ext. 1804 or on Twitter @MorrCoSentinel.